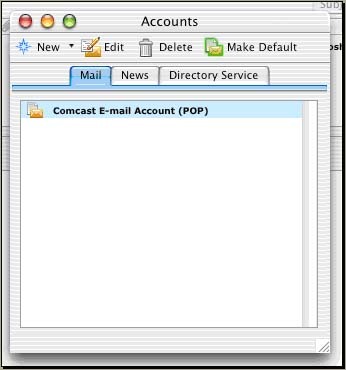 Comcast Kills Sending Email - Sage Advice Ltd.
Over the past several months, Comcast users have been slowly losing the ability to send email. Without any warning, they are blocking sending mail on the default port and instead forcing users to send mail through port 587. Unfortunately for users, they didn’t (or don’t) notify you when this happens and all of a sudden you can’t send any email. This is frustrating to say the least! But the fix is easy. 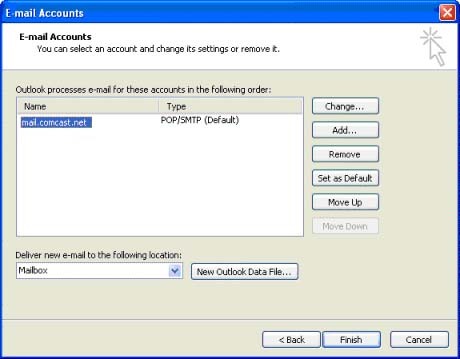 All you need to do is to change your email program’s preferences for the SMTP port. 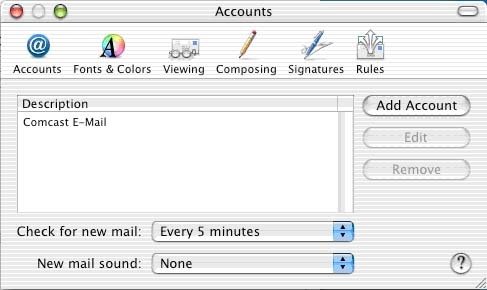 This is different for all email clients (Outlook, Entourage, Apple Mail). 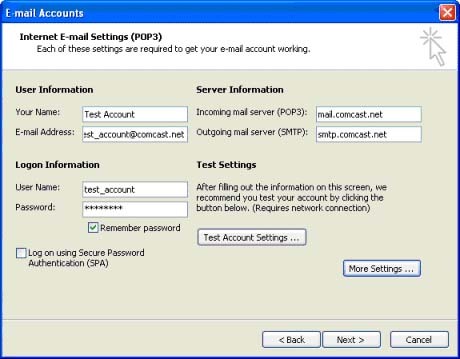 Here are the settings for a few of the more common email programs. 2. Highlight your Comcast email account by clicking on it once, and then click the Edit button. 3. 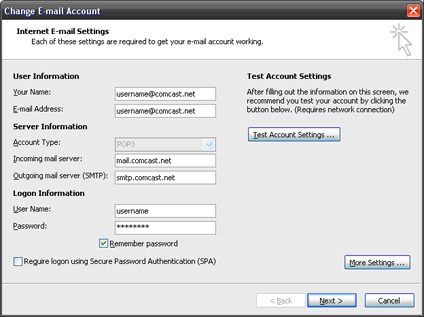 At the bottom of the Account Settings screen, make sure that the SMTP Server field is set to smtp.comcast.net and then click on the Click here for advanced sending options button. 4. 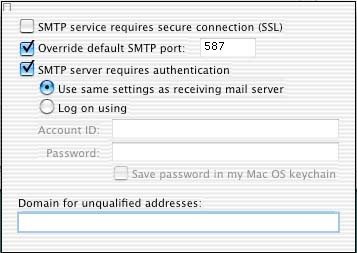 In the new window, put a check in the box labelled Override default SMTP port: and edit this field so that it is set to 587. 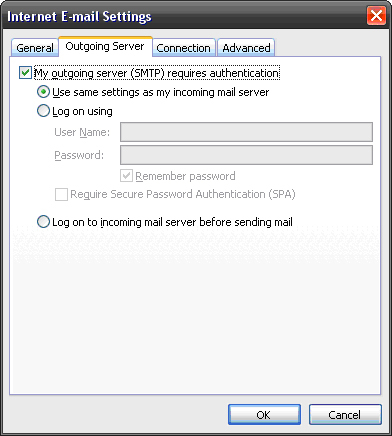 Also, put a check in the SMTP server requires authentication field and select the Use same settings as receiving mail server option below it. 5. You can now close all of the open windows and return to the main Entourage window. You are now configured to use port 587 to send email with Entourage. 1. Launch Mail by selecting it from the dock. 2. 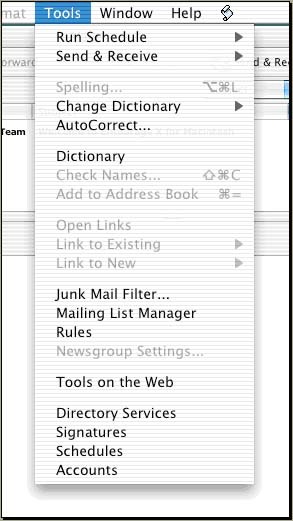 Open the Mail options from the top menu and select Preferences from the dropdown list. 3. 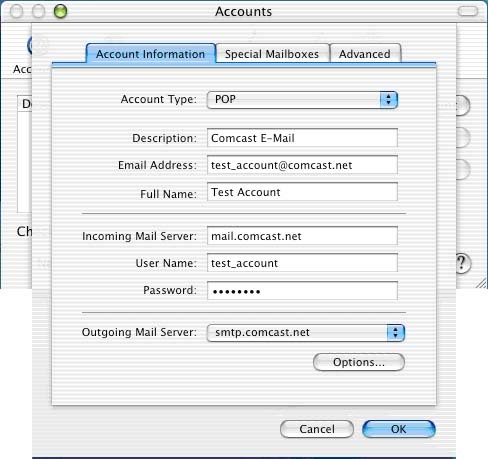 Select your Comcast email account on the Accounts screen and then click the Edit button. 4. 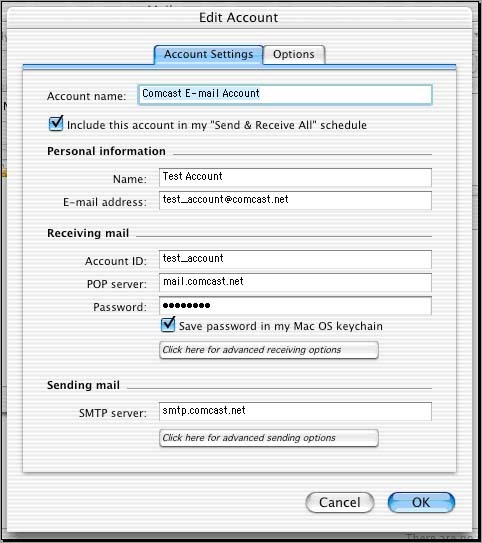 On the Account Information tab, make sure that smtp.comcast.net is the selected Outgoing Mail Server at the bottom of the screen and then click on the Options… button. 5. 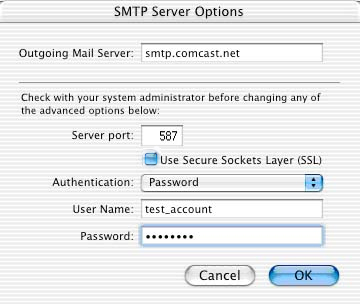 On the SMTP Server Options window, change the Server Port: to 587. Make sure that Authentication: is set to Password and enter your email username and password in the designated fields. Click OK to return to the Account window. 6. Close the Accounts window by clicking on the red circle in the upper-right corner of the window. 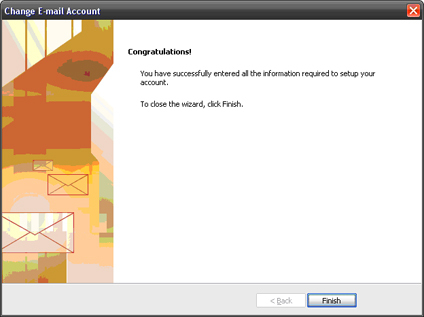 You are now configured to use port 587 to send email with Mail. 1. 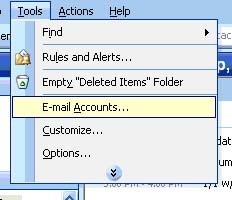 Open Outlook 2003, select Tools from the top menu, and then E-mail Accounts… from the pull down list. 2. 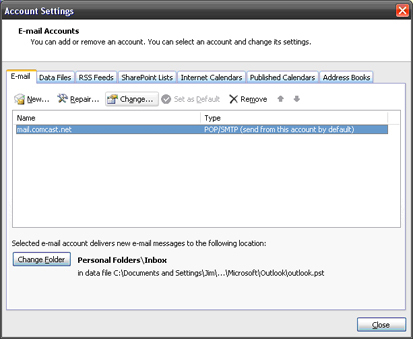 In the E-mail category, select View or change existing e-mail accounts and click the Next button to continue. 3. Select your Comcast.net email account, and then click the Change button. 4. On the Internet E-mail Settings page, click the More Settings… button located in the bottom right corner of the window. 5. 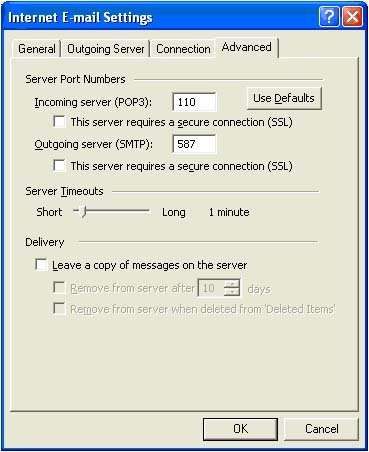 Select the Outgoing Server tab, and put a check in the box labelled My outgoing server (SMTP) requires authentication. 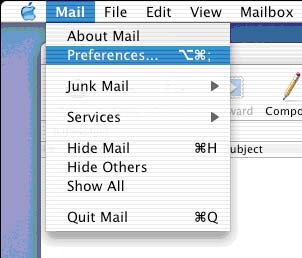 Also, select Use same settings as my incoming mail server. 6. Click on the Advanced tab and in the Outgoing server (SMTP) field, delete the current value in this field and type in the value 587. 7. Press the OK button to return to the previous menu. At this point, you can test your settings by clicking the Test Account Settings… button. If everything is configured properly, each of the tests will have a green check mark next to them. If any of the tests fail, go back and make sure that each setting is configured correctly. 8. After you close the Test Account Settings window, click Next and then Finish. 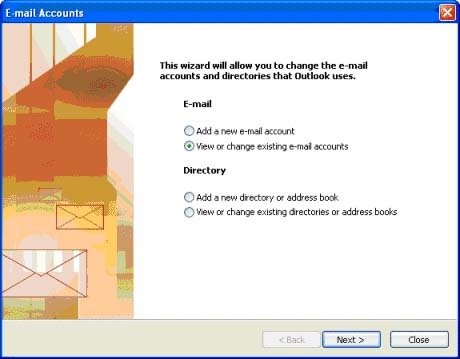 You are now configured to use port 587 to send email with Outlook 2003. 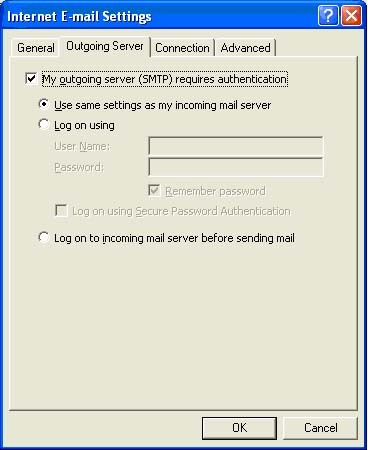 In the Internet E-Mail Settings window, click the Outgoing Server tab and check the My outgoing server (SMTP) requires authentication box. The Use same settings as my incoming mail server radio button should be selected as well. 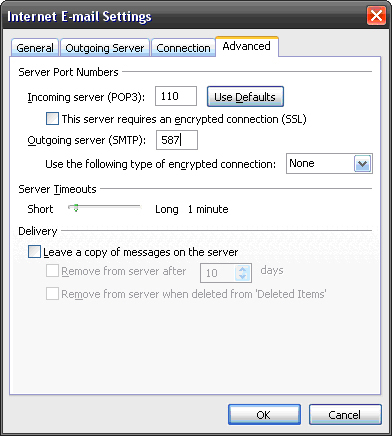 Click the Advanced tab and change the Outgoing server (SMTP) from 25 to 587. Click OK.